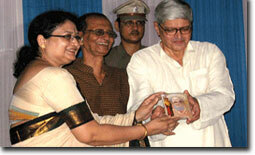 His Excellency the Governor of West Bengal - Shri Gopal Krishna Gandhi inaugurated the CD of 8 Brahmosangeet penned by Rammohun Roy, sung by various artists at a function at the Museum on 14th September 2009. Speaking at the occassion- the Governor remarked that this CD was of great historic value and played glowing tributes to Rammohun. Speech by Dr. Sugata Bose on the "Rammohun O Banglar Nabojagoran". Speech by Dr. Uma Dasgupta on the "Visva Bharati - A World in One Nest". Prof. Parthasarathi Majumder, Department of Physics Ramakrishna Mission Vivekananda University,speaking on " Black Hole Mystery".